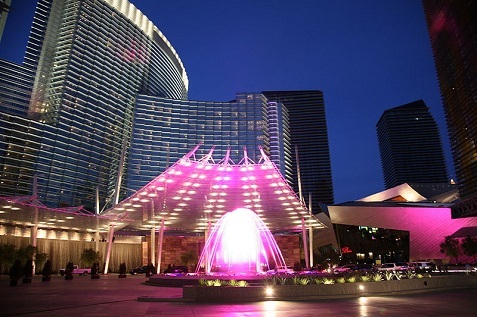 Aria is the largest hotel in the world to be awarded the LEED Gold certification. Put simply, LEED is a system of rating buildings for their “green” efficiency. So for example, things like power consumption and the use of ecologically friendly materials in construction. Guests actually have the option of saving their settings so that when they return, even if it is a year later, everything will be exactly as they left it. In addition, technicians are working on a way to allow guests to control their room from afar, say through a phone app, such that guests could turn on their air conditioning before returning to their rooms so that when they do arrive, it’s already cold. Aria’s wireless system is formidable. Described as “heat sensitive,” the Wi-Fi network is able to read the density of activity on the network and boost Wi-Fi strength for parts of the grid that require more bandwidth. So if a huge fleet of busses filled with people desperate to check their email unloads at the front door, your phone’s internet is not going to struggle to keep up with the influx of new traffic. Aria promotes choice – for both itself and the customer. Instead of having “static” machines that house one particular game, or even a collection of different games, Aria opts for variable “gambling stations” that are controlled from a 300-square-foot data center. Each station sports an HD screen, and what is on the screen depends entirely on what games happen to be popular. Anything can be put onto the screen. So if blackjack happens to be more popular that weekend, there will be more blackjack put onto these multi-purpose displays.